User intent is a major factor in search engine optimization and conversion optimization. Most of the talk about customer intent, however, is focused on SEO not CRO. The fact is, however, CRO and SEO converge so closely in this area, it’s impossible to separate the two. I want to take a fresh look at user intent, but provide more focus on the conversion optimization side of the issue. Here’s my thesis: User intent is the starting point for successful conversion optimization. If you fail in addressing customer intent, you fail in conversion optimization. If you succeed in addressing customer intent, then you succeed in conversion optimization. That’s the simple reality, and there’s no way around it. User intent describes what a user is looking for when they conduct a search query. This goes beyond the superficial idea of “keywords.” Keywords are just that — words, and they are nearly passé in the age of semantic search and highly developed algorithms. The customer’s intent is what those keywords or queries are really driving at. Transactional – The user is prepared to buy or to perform some other specific online activity. The basic idea is that everyone who performs an Internet search has a specific intent. They want something. The content that appears in the search results should meet their intent. 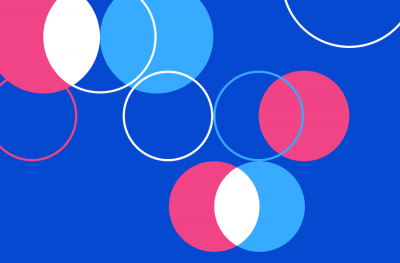 What does user intent tell us? Most people are interested in user intent as a search engine optimization strategy. This makes sense. If you can figure out the customer’s informational intent, then you can deliver content that meets that informational need. The results are more and better traffic. Scott Linzer, who directs Search Engine Marketing for AKQA, explains the connection between customer intent and the response of companies with their content approach. At its broadest level, user intent tells us what customer’s want. User intent is really about marketing. User intent signals the major shift in digital experience today. No longer is SEO a strategy unto itself. Instead, SEO has rolled into the broader fields of marketing, including conversion optimization. When an SEO starts thinking about user intent, he or she is actually thinking about how to best meet the needs of a potential user. 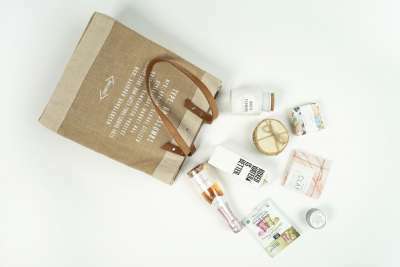 That, at its core, is an exercise in marketing — giving the user what they need and are looking for. 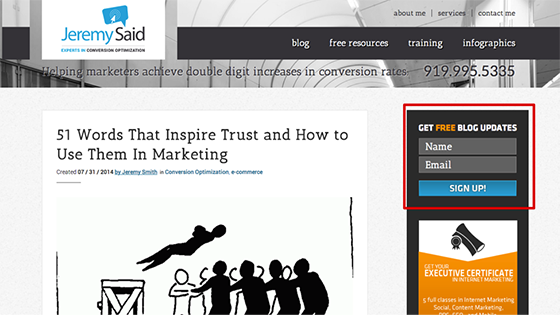 How to apply user intent to conversion optimization. With that basic idea of user intent, how do we take this knowledge and transfer it to conversion optimization? Actually, there’s really no transfer that needs to happen. As I just explained, customer intent is really about marketing. More specifically, it’s about conversion optimization. Meeting a user’s intent is about creating a landing page that is optimized for more conversions. What we need to do now is apply it in specific and tactical ways. 1. 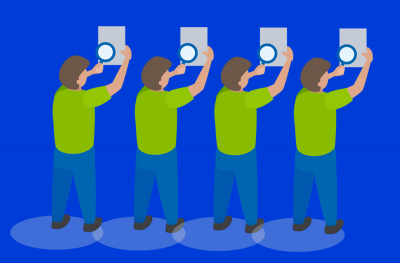 Identify the queries that bring users to your site. The first thing you have to do is understand the queries that drive traffic. This is a simple matter of analytics and webmaster data. A quick-and-dirty way to get your data is to go to Google Webmaster Tools → Search Traffic → Search Queries. My GWT data displays some of the most popular queries that bring users to my site. Using this data, I can move to the next stage of optimizing for these queries. 2. Understand the intent of those queries. Behind every query is a specific intent. What is the intent behind these queries? That’s my next task, and it’s not hard to achieve. Remember, there are three major types of queries — navigational, information, and transactional. The first query in the list is “words that inspire trust.” That is obviously an informational query. 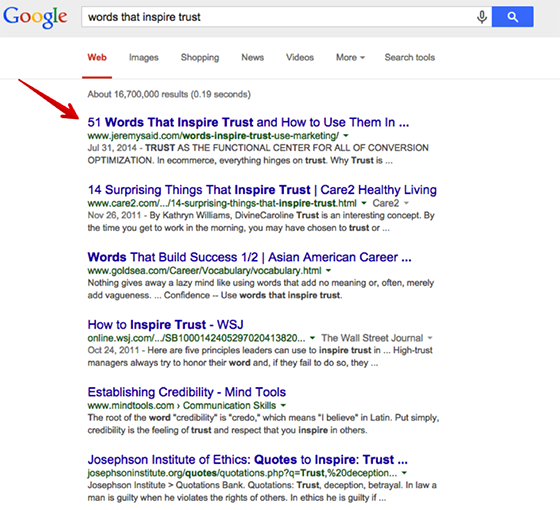 The users who search for “words that inspire trust” have information as their intent. This is why I have such high numbers of searchers accessing this particular article. The article even outranks the Wall Street Journal. Because it is an informational query, I provide an informational result. The users aren’t looking to buy anything. However, they do want the information that I have provided. This is where I introduce conversion optimization techniques. When the searcher arrives at my website, they have the opportunity to get more great information. None of this is over-the-top or salesy. The article itself is packed with information, examples, screenshots, case studies, research, and more than 2,000 words of valuable content. In conversion optimization, you first meet the user’s intent. But not all queries are for information. This is a navigational query. A user who types in “Jeremy Said” is probably not searching for information about what Jeremy said. That wouldn’t make sense. 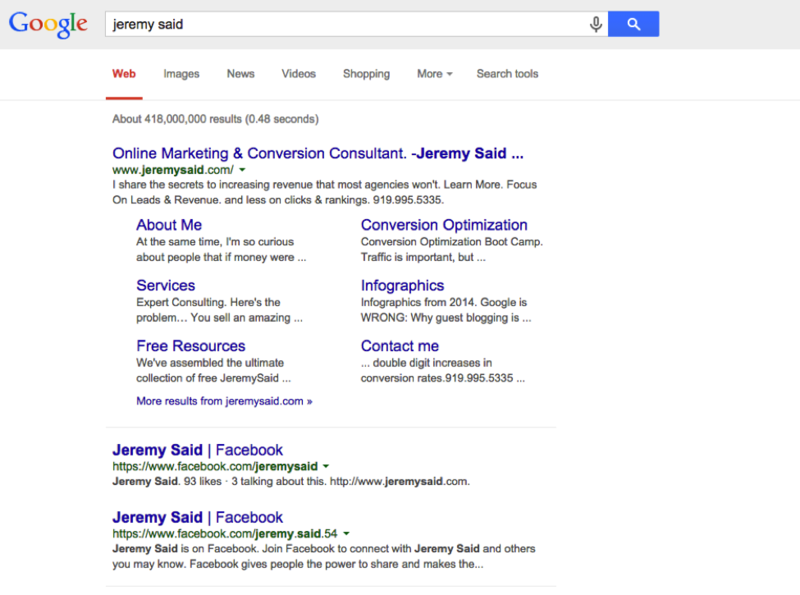 In this case, “Jeremy said” is a branded term — the name of my blog and consulting business. Here’s the SERP for that query. When it comes to navigational queries, you don’t have to do much conversion optimization. From an SEO perspective, it’s a given that you’ll win the navigational query. However, you do have to work to build out a strong site (to get sitelinks), great content, and a social presence. This is where you can unleash the full arsenal of conversion optimization tactics. My intent is obvious. The word “buy” is a dead giveaway. Here’s what I get. I go straight to the brand website, because I want to buy the headphones from the source. The purchase page is effective. Although it’s not a landing page in the technical definition, this is still a page that is ripe for conversions. 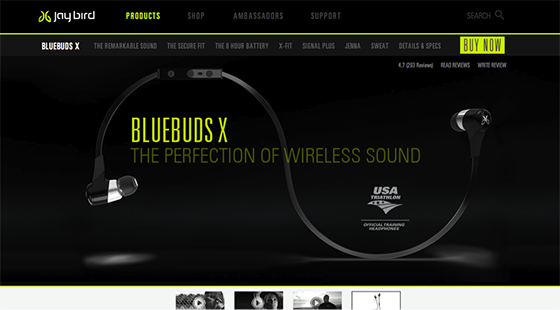 Like every good landing page, it has a headline: “bluebuds x.” This is a slight drawback, because the query was for “jaybird headphones.” I’ll give them a pass, since they Jaybird brand name is in the upper left corner, where eye paths generally begin on web pages. The “bluebuds x” headline has a subheadline: “The perfection of wireless sound.” This subheadline compels the user with a subtle encouragement towards their purchase. The page also features a strong image — a picture of the headphones. This is the second main indication that the user is on the right page. The CTA is strong. Featuring CTAs on a dark landing page is challenging, because it reduces the array of colors and shades that you can feature. Jaybird did a pretty good job. Although the CTA is the same color as the headline and top menu, it stands out enough to make it noticeable and clickable. This is the whole goal of the page. The query was transactional, and the customer intends to buy. The wording of the CTA, ”buy now,” is strong, but not too strong for the transactional intent. Let me walk through one more transactional query, so you can see how conversion optimization comes into play. Transactional queries aren’t always about buying. They do, however, reflect an intent for some level of action. It could be for coupons, for discounts, for trials, for samples, or for just about anything besides information and navigation. Let’s check out Optimizely, since they have the first paid position. 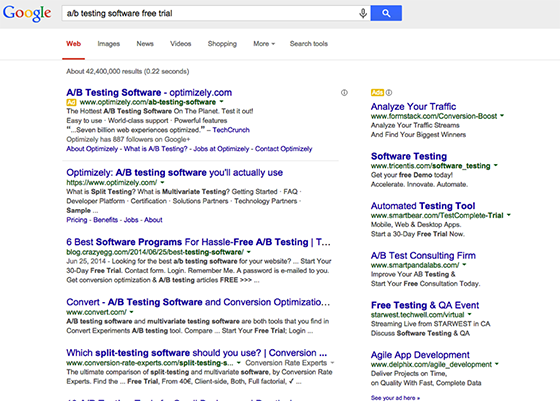 They use the words “a/b testing software” in the ad headline. Since this was my query, I will immediately notice that heading. I am more likely to click on it. They use the CTA “Test it out.” Again, this aligns perfectly with the intent behind my query. “Free trial” signals my desire to test a software. Optimizely wins my CTR, and I’m in — checking out their landing page. 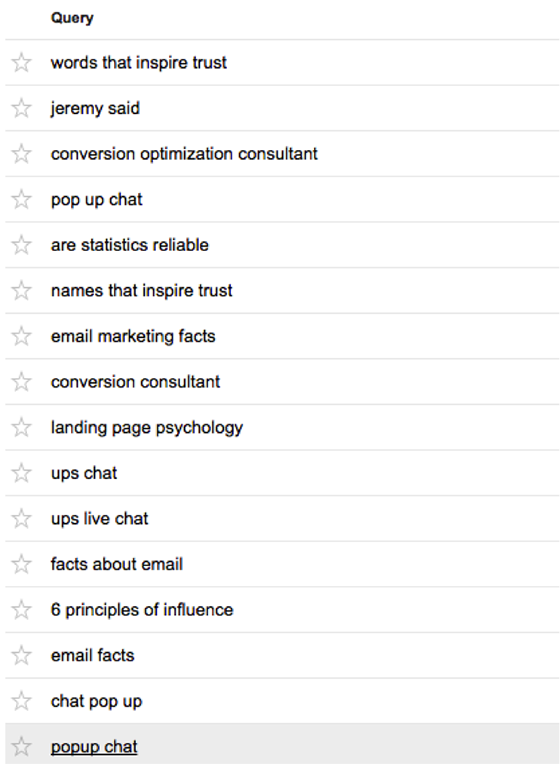 Optimizely has a stark landing page. Some would call it boring. However, I see it as effective, especially considering the intent of my query. I won’t go into a full-fledged critique of the landing page. Instead, I’ll point out some of the specific wins. Repetition of the query in the headline. Again, this assures me as a user that the page meets my intent — to find an A/B testing software. 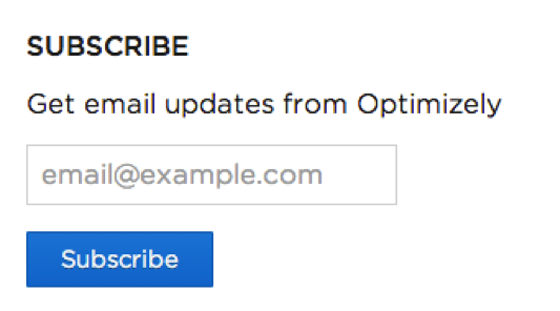 A capture form that invites me to “try it out.” My query intent was to have a free trial. “Try it out” is basically the same thing. The CTA is “Test it Out” which addresses my transactional query precisely. 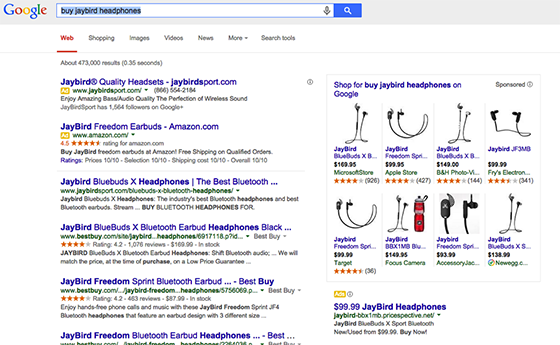 That is an example of how a landing page, in this case for a paid search, has optimized for intent. Let me make a few more observations regarding how customer intent should affect conversion optimization. Develop segmented landing pages for specific transactional queries. I’m a proponent of making lots of landing pages. You may have a single product, but you should still have a variety of landing pages. Each landing page should be designed to match the user’s intent, not just to pitch your product. If you don’t meet a user where they’re at, then you are unlikely to gain their conversion. Develop unique CTAs and offers, depending on user intent. User intent has an effect on the whole process. The user has an intent when they type in a query. The user has an intent when they see the SERP. The user has an intent when they click on a SERP entry. The user has an intent when they view the page. If you have successfully optimized the process up until this point, don’t stop. 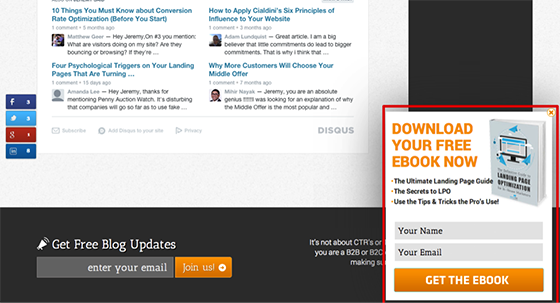 Your conversion action should also meet the user’s intent. For example, if a user entered an informational query, it’s very unlikely that they are ready to test your software or buy your eBook. Instead, you want to lure them in with a smaller offer — an email signup list, a free webinar, etc. 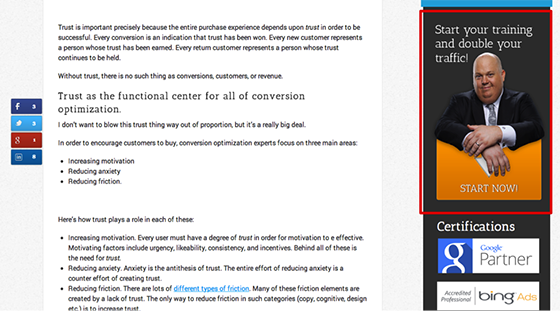 You can also optimize the copy of the CTA itself to the user’s intent. In spite of my detailed treatment of the subject, the core idea is quite simple: optimize for intent. Conversion optimization can (and should) go all Rambo on button size and specific words, and CTA placement and all that. Go ahead and do all that. Do all the A/B testing. But keep in mind that conversion optimization is about way more. It’s about backing up and paying attention to the customer’s intent. Based on that intent, what would the user be most likely to convert on? What type of action might the user intend to take? What type of next steps would the user be interested in? These are important questions. Without even talking about button color or long-form copy, we’re able to get in the mind of the user and deliver exactly what they want. And that’s what conversion optimization is ultimately about.